Who is secular and who is religious! Secular means unrelated to religion and secularist state do not sponsor any particular religion. Constitution of USA has a mandate to be secularist state. 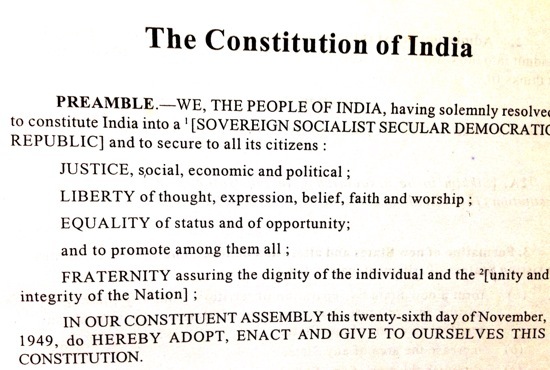 Constitution of India did not use this word secularism but 1976 amendment added words ‘socialist secular’ in the preamble of the Constitution of India. A few days ago I had pointed out that Barak Obama has failed as a Black President in so far as ethnic violence is concerned in USA and that USA needs a debate on Black and White ethnicity and harmony. I also find it distasteful practice to start session of house of representatives in USA (in certain states) with religious prayers, but that problem has yet to blow itself up. A similar problem exist here in India and that is about secularism. What secularism actually meant over the time, in history? Historically, the secular word gain its prominence in 15th Century when Catholic church had its tentacles in every walk of life. Free speech meant to speak what church approved to speak. USA led a way and established a State that would not sponsor any religious following. Thus it precedes, French which enacted law for separation of church and the State in 1905 and thus declaring Laïcité. Later this word has been frequently used in France to refer to public institutions free from religious influence. This way, personally I would prefer the word Laïcité over secularism but we have little choice in these matters. Another interesting aspect is that laicite itself is under debate in France where it is felt the its Muslim population is not sensitive enough towards laicite. Read this article in New York Time in this regard. In two words : Muslim appeasement. Sorry friends, no muslim would agree with me. I would correct myself. Appeasement of muslim politicians. Hope I got it right this time. In past over 67 years of independence, Muslims in India have not progressed. They by majority remain, workers, artisans, mechanics and similar blue class workers. If we take into consideration the Middle Class in India and its share of muslim population, it would not be same as muslim population’s share in India. That’s why I changed the appeased class. The people who benefited were politicians who fired guns on the shoulder of political parties and gained electoral victories at the cost of State. But this is right time to start the debate on correct meaning of secularism. Does that mean that Government of the day can pick and choose and favour people of any religion? Or does it mean the Government will not interfere in religious aspects of religion? or Both. And what must be the other boundaries of the Government to ensure that it is on the path of secularism. Freedom of India was welcomed by blood shed of Hindus and Muslims. Since no proper record was maintained, both sections claim that their people were slaughtered in larger number. But in any case it was the bloodiest and largest exodus which happened in the east. In two words: Hindu Bigotry! Officially, India has the third largest Muslim population next to Indonesia and Pakistan. India is home to 10% of the world’s Muslim population. India has around 180 million Muslims (2011 census). This out of total population of India at about 1.2 billion. Hindus constitute slightly less than 80 % of population. Bigotry on the part of Muslim Politicians have been order of the day. Since Muslims vote en blanc at the calling of the leader (different at different places), the main stream parties are always in awe of such leaders. In a country where voting percentage hovered around 55 percent (increased to 67% in last election), 20% of muslim vote bank was an assurance to victory. But now things have become more dangerous. Hindu bigots are also in the main stream. They are harbouring their own constituencies. If bigotry does not stop, soon we have a situation like USA where Bobby Jindal had to bigot Hindu religion to announce his candidacy for president. Being christian alone was not enough. In India the process of polarisation of population which was started by partition of country on religious lines and fuelled by permitting Muslim Schools to have their own education system, family law etc. while denying the same to other religions, is soon going to harvest. It would be a good time to define the limits of Religion in public space. Violence begets violence. Countries which earlier closed their eyes to terrorism as America’s problem (as it created it) are now forced to face it. Terrorism is physical end of oral bigotry. If religious affairs are kept out of public domain and strict separation of religion from politics is maintained by all political parties, then only can we save us from blood shed waiting for us in future. My apologies for being so bleak about future. But there is a reason for this bleakness. There are always people who have nothing to do with religion or politics and who wait on the sidelines for an opportunity to wreak violence. It will not be the common citizen who will be the perpetrators but they will be victims. Like they were in 1947 and in 1984 apart from numerous riots around country since 1947 (and not just 2002 Godhra riots which got undue attention). This entry was posted in Politics and tagged Hindu Muslim relationship in India., laicite debate, Polictics in India, religion, Religious bigotry, Secularism. Bookmark the permalink.